This CNBC slide collection of extreme, off the beaten track RVs starts with the smallest vehicle and soars into grand, opulent spaces that dwarf my apartment. The smallest, coolest, most inventive RV is the Opera, a compact trailer that amazingly turns into a “mini-Sydney Opera House.” Created in the Netherlands, It features heat, a teak veranda, hot running water, a fridge, ceramic toilet and low-energy LED lighting. Praised in the international press, Its unique design has won numerous awards. Perhaps, however, the striking design was too ahead of its time or priced too low at $41,165, because the Opera could not sustain a profit and production was halted in April. A self-contained expedition vehicle, the Unicat is designed for those craving off-road adventures (and who happen to have upwards of $500,000 on hand). It features a two-month supply of all the comforts of home including a solar powered system that can decontaminate or desalinate any water. Pretty it ain’t (some have compared its looks to a garbage truck) but this survival beast can take on the roughest of terrain, desert and mountains and plow through rivers four feet high. Speaking of water, if you’ve got a spare million bucks or so around you might want to take a look at the TerraWind, a super deluxe, amphibious motor coach. The boat part was built first. When the hull proved itself sound, the RV part was added. Its high gloss, spiffy interior sports teak cabinets, granite counters, dishwasher, washer, dryer, a Jacuzzi and a 42-inch plasma TV. It sleeps four. For the athletic, there’s also a swim platform. Nascar fans might want to check out Featherlight Coaches, the official luxury coach of Nascar. Debuting at $2.5 million, their top of the line Platinum Plus modelwas dubbed the most expensive RV on the market. It features a sports car stored in a lower compartment usually reserved for more plebeian luggage, African sapele Pommele veneer (sounds pretty ritzy whatever it is) on the dash, marble steps, Italian leather ceilings and onyx shower walls. The bed is king size befitting any man owning the king-sized treasury necessary to buy it. None of these RVs could be described as frugal. But in the cold, gray days of February, fanciful thoughts of their racy readiness to hit the open road could help shorten the time till Spring shows its sunny face. If you’re an RV type, that is. Are You? 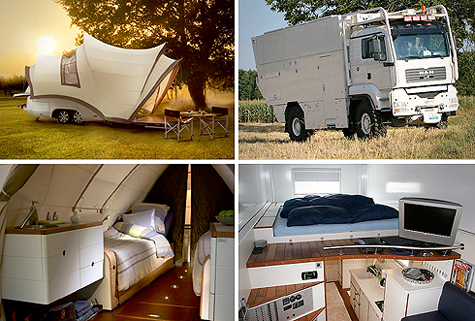 I’d love to have just a simple teardrop trailer–bed and cooking facilities only. I often wonder what the gas mileage would be on some of these beasts. Surprisingly, some of the mileage on those things wasn’t bad at all. Just had a thought. With all the news lately about Google’s driver-less car, just imagine an RV plowing down the highway with an invisible computer at the wheel instead of a driver. Wow these seems like a lot of cool RVs. I watched a video on one of these all terrain RVs, and it takes a lot of money to fill it. But it also lasts you for a long time and you can go just about any where and survive for a long time. Yes, and from the looks of some of those things, survive in comfort too. The Opera RV is cool! Btw, the kitties are home safe. They showed up together all of a sudden after 11 days missing. I should have told you sooner. I caught your Twitter comment on your kitten’s return home, Guess you missed my Tweet about it. But it’s amazing after 11 days gone. I’d wonder where the heck those rascals spent that time. Can just imagine the joyful reunion all around. The opera is very eye catching! Looks like something from a sci fi movie.